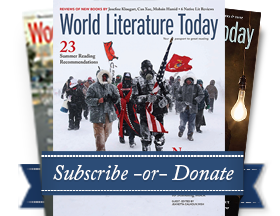 Latin American Literature Today is published from the University of Oklahoma in Norman, Oklahoma, in affiliation with World Literature Today, the bimonthly journal of international literature. The Neustadt Festival, during which the Neustadt International Prize for Literature is awarded every two years. Past winners of the Neustadt Prize include the Latin American authors Gabriel García Márquez, Octavio Paz, João Cabral de Melo Neto, Álvaro Mutis, and Claribel Alegría. The Puterbaugh Festivals of World Literature and Culture, whose past fellows include Jorge Guillén, Jorge Luis Borges, Octavio Paz, Dámaso Alonso, Julio Cortázar, Mario Vargas Llosa, Carlos Fuentes, Guillermo Cabrera Infante, Manuel Puig, Luisa Valenzuela, Roberto Fernández Retamar, Nélida Piñon, and Andrés Neuman.